Last week Teena spent a few days in Kelowna BC, and knowing I love trying new beers, brought me back some I cannot get hold of here in Ontario. One of them was a Mt Begbie Tall Timber Ale. 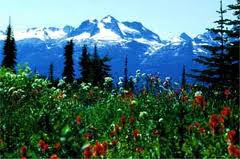 Mt Begbie Brewing was opened in 1996 in Revelstoke British Columbia by Bart and Tracy Larson. Bart is the brewmaster and Tracy does the accounting and sales. Both have unlikely backgrounds to be in the brewery business. Tracy studied biology and zoology, while Bart earned his PHD in nuclear physics. Loving beer and brewing his own before it became popular, he faced a decision. Head south with his degree or stay home in BC, and brew beer. They have won many awards over the years. Most recently in 2010 two of his beers one a wards at the 2010 Canadian Brewing Awards, their Nasty Habit IPA won gold while their and High Country Kölsch brought home Silver. The brewery is named after Mt Begbie, the huge mountain that towers over Revelstoke. The mountain was named after Sir Mathew Begbie, who was the first judge of the Supreme Court in BC and became known as the hanging judge. Mt Begbie Brewing is known for it's historic photos on it's beer labels. The 650 ml bottle of Tall Timber Ale, which is the companies most popular beer, features a 1897 photo of three miners in the great Western Mine on Revelstoke. It pours brown in colour with a slightly brown head. The malt comes through in the aroma. I notice as the head fades there is lots of lacings left behind on the glass. The malt comes through in the taste, which is not unusual for a brown beer. Hops although not prominent do their job in ensuring that the sweetness of the beer is under control. This is a nice, enjoyable beer. Makes me hope one day to be able to try more from this brewery.